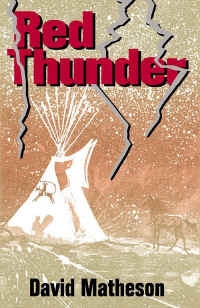 Description: Red Thunder is a memoir of a People, the Schee-tsu-umsh Indians, now called the Coeur d'Alene Tribe in Northern Idaho, USA. The story follows several generations of the tribe from birth to adulthood, old age to death and explores the themes of courage, family, love, tragedy and hope. The author has translated genuine oral histories and incorporated them into the lives of Sun Bear, Rainbow Girl and the tribe of Schee-tsu-umsh Indians. This authentic work displays the rich cultural teachings behind Native American life in a very real and relevant sense that is applicable to our times. David Matheson has been a member of the Coeur d'Alene Indian Tribe since his birth at the home of his grandparents in 1951. He has served as a Council leader, the Tribal Chairman and manager of various tribal operations over his career. He is a traditional leader working to retain cultural traditions, the native language, and ceremonial practices of his native people. Matheson holds an MBA from the University of Washington and resides in Northern Idaho. 2001 paperback. Very good condition but for light soiling to part of page bottoms from shelf wear. Text is clean and unmarked. Sound binding.